Yesterday, the Huffington Post picked up a post originally published on Amazon Watch's Eye on the Amazon blog, written by Paul Paz y Miño, who spent a few weeks in Judge Kaplan's courtroom following Chevron's retaliatory RICO lawsuit against Steven Donziger and the Ecuadorian villagers who won a historic judgment again the oil giant for its contamination in Ecuador's rainforest. Paz y Miño's post is a powerful indictment of the so-called testimony of disgraced former judge Alberto Guerra, who was Chevron's star witness during the trial. Read the post below or check it out on The Huffington Post. Having virtually all the money in the world often means you can buy silence, you can buy time, and you can buy lies. Chevron has demonstrated this time and again in its decades-long battle to evade accountability for deliberately dumping 18 billion gallons of toxic wastewater into the Ecuadorian Amazon. The problem is that this time what Chevron has bought is a bag of lies in the form of false testimony from a thoroughly disreputable source, and they aren't able to hide the price tag. In the ongoing saga of Chevron's scorched earth legal strategy, last week disgraced former judge Alberto Guerra testified in support of the company's most explosive allegations – that the judgment against Chevron was ghostwritten by the plaintiffs and that his efforts to seek bribes were partly on behalf of Judge Nicolas Zambrano, who issued the historic $19 billion final judgment in the Ecuadorian environmental litigation. 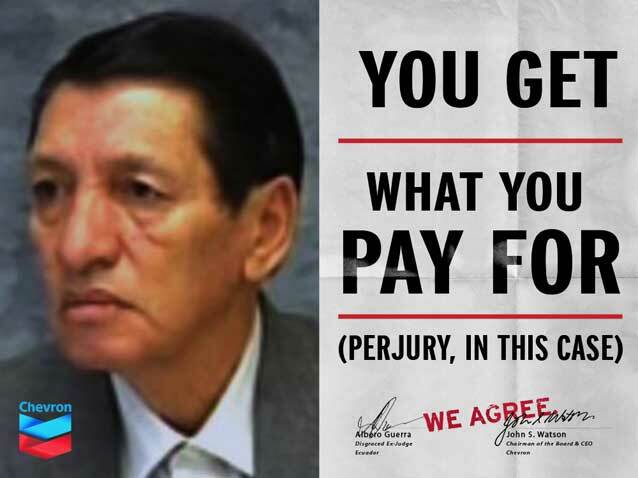 Somehow, Chevron expects the court (and the public) to believe that a man who has admitted to fixing cases and accepting bribes throughout his career as a lawyer and a judge is being honest this time, despite receiving hundreds of thousands of dollars from Chevron for his testimony. And everything depends upon his word, as the supporting "evidence" that he's presented is laughably incomplete (he claims that his computer died, and that's why he has essentially nothing to back up his story). For months Guerra worked with Chevron to prepare his testimony – and yet it was STILL full of gaping holes and contradictions. Amazon Watch was there in court and couldn't help wondering how anyone could take Guerra seriously. Of course, there's no jury in this trial – something Chevron worked very hard to guarantee – just a wall of stone-faced lawyers whose fat paychecks depend upon Judge Kaplan accepting Guerra's testimony as credible (or at least convenient). It doesn't take a law degree to see that a man who's known for being a "liar for hire" and who has admitted that Chevron is paying him more than 20 times his prior salary is NOT a credible witness. But Chevron is operating in a legal realm of its own creation. It's one where you can sue the victims of your own environmental abuses, where you can prevent consideration of any actual evidence in the case, and now where you can pay witnesses whatever you like to give their "testimony" on your behalf. "That Chevron and its counsel have crossed the line here cannot seriously be debated. If a party or its counsel were permitted to pay a testifying witness for physical evidence, beyond the reasonable value of that evidence, and to pay the witness a salary in exchange for an agreement to testify, there would be little left of the rule against compensating fact witnesses. That is precisely what has occurred here." The Ecuadorians have now moved that all of Guerra's fraudulent testimony be stricken. Remember, this was the best Chevron could do on this case. They know that they can't discuss the abundant evidence of their misdeeds – it still sits in toxic pools by the hundreds in Ecuador – so they've pinned their feeble accusations of a sinister conspiracy on claims of a corrupt legal process. I think they have managed to uncover some corruption, however. So when will Chevron and their legal team be brought before a court to answer for paying a confessed charlatan to commit perjury?